Actors becoming directors is a common trend in Hollywood, and tends to usually mark a new phase in the careers of performers like Clint Eastwood, Ben Affleck, Ron Howard and many others. However, every once in a while you come across one actor who, for their first major film behind the camera, tries to do too much all at once to leave an actual first impression, and ends up creating a well-intentioned but still rather clumsy mess. Sadly, it is Ewan McGregor’s turn to fill this role, as his directorial debut American Pastoral – based on the Phillip Roth novel of the same name – has admirable goals that are never quite reached, and is a film that often flounders in certain parts of its execution to prevent it from working as a cohesive whole. A clunky framing device sees former high school student, and recurring character in many of Roth’s novels, Nathan Zuckerman (David Strathairn) attending a school reunion where he learns from an old friend (Rupert Evans, in some rather distracting old-age make-up) that his brother, popular all-star athlete Seymour “Swede” Levov (McGregor), has recently passed away. Still awed with memories of the popular jock and wondering whatever happened to him after graduation, Zuckerman sits down to hear the whole story, which is where we spend the majority of the movie. We learn that over time, Levov married his young sweetheart and former beauty queen Dawn (Jennifer Connelly), and had a daughter named Merry (Dakota Fanning) who grows up with a rather bad stutter. However, as the Vietnam War rages on in the background, Merry becomes increasingly angry with the political situation and frequently attends anti-war rallies in New York, showing more signs of radical activism with every passing day. It all comes to a head when Merry commits a dark act of political terrorism, and her subsequent disappearance begins to unravel Levov’s seemingly perfect life, from his marriage to his job to everything that he holds dear to his heart. The thing about McGregor as a director, at least from the basis of this film, is that he does seem to have an understanding about how this whole directing thing works. He can create a decent mood, pace certain scenes just right, and get some very good performances out of his cast. However, the fatal mistake was by choosing this property to adapt as a first-time director in the first place. Roth is a very complex and articulate writer, and his stories are usually underlined with brash and conservative ideas that any filmmaker, regardless of their track record or lack thereof as a filmmaker, would struggle to successfully convey into a major theatrical release. As you can imagine, McGregor more often than not has difficulties pinning down the same themes and disturbing views of 20th century America that Roth was able to do, letting his adaptation meander about freely without finding a solid focal point to cling on to, and often looking rather clueless as to what its point of existence is. It should be noted that the film was originally intended for a much more experienced director, specifically Phillip Noyce whose filmography includes Patriot Games, The Bone Collector and Rabbit-Proof Fence among others. Had he stayed on the project, instead of dropping out and allowing McGregor to become more involved than just the lead actor, the film might have honestly had a better chance, because the script – written by The Lincoln Lawyer’s John Romano – is honestly fine; it’s just the execution that’s a little off, but that’s more down to McGregor’s clear beginner’s woes than actual incompetence. On-screen, it is also McGregor who also seems to succeed the least out of his cast. He tends to be over-the-top in some of his more dramatic scenes, which perhaps shows a lack of restraint as both an actor and director, and even in quieter scenes he must still tackle a dodgy faux-American accent that is less convincing than Benedict Cumberbatch’s in Doctor Strange (to be fair, McGregor has struggled with pulling off that accent throughout most of his career). It’s odd how, in a film that he not only starred but also directed, he still manages to be the least credible thing in the entire movie – but maybe that’s because he’s secretly allowed his co-stars to work with more material than his bland boy-scout of a character. Jennifer Connelly does some strong work here as a wife and mother struggling with her inability to properly cope with events around her, eventually resorting to madness and even further drastic measures to fill her own void. Fanning, in what little on-screen time she actually has compared to McGregor and Connelly, is also very good, despite being saddled with a stammer that often distracts from the actual performance she’s trying to give (in fact, it was reminding me not so much of The King’s Speech, but of the fake film-within-a-film Simple Jack from Ben Stiller’s Tropic Thunder, which – if you’ve seen that film and know the controversy around that joke – can be rather unfortunate in how cartoonishly it is portrayed). I do like McGregor as an actor, and I’m sure that he can be a good director if he’s given the right project, but American Pastoral isn’t his finest moment in either role. It has sincere ambition, but ultimately it proved to be a hefty source not fit for a first-timer. Sorry, McGregor, but better luck next time. 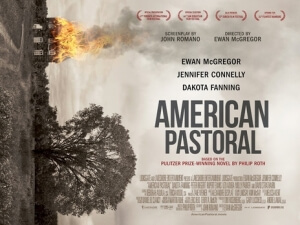 American Pastoral marks the directorial debut for Ewan McGregor, but his inexperience behind the camera clearly shows through his ambitious but short-sighted attempts to adapt the complex Phillip Roth novel, even struggling to seem plausible when acting on-screen alongside Jennifer Connelly and Dakota Fanning, which leads to it being a bit of a mess.